Have you read the now-classic book How to Talk so Kids will Listen and Listen so Kids will Talk? Ever wished there was a version that would help you with younger children who perhaps aren’t quite ready for a detailed problem-solving session? Well now there is! Adele Faber is a co-author of the original book; Adele’s daughter Joanna and Joanna’s childhood friend Julie King have teamed up to write the new version of How to Talk so LITTLE Kids Will Listen, packed with examples of how real parents have used the information they’ve now been teaching for over 30 years. Join me for a chat with Julie King as we work to understand the power of acknowledging children’s feelings and some practical tools to help engage your younger children to cooperate with you. Update 5/10/17: An eagle-eyed listener noticed that Julie mentioned her 10-year-old son wanting to sit on the front seat of her car, while the Centers for Disease Control and Prevention (CDC) recommends that children 12 and under should sit in the back seat. Julie was recounting an episode that happened long before there were CDC recommendations on where children should sit in the car, so please don’t take this as an ‘OK’ to put your 12-and-under child in the front seat. Thanks! Jen: 00:21 Welcome to the Your Parenting Mojo podcast. 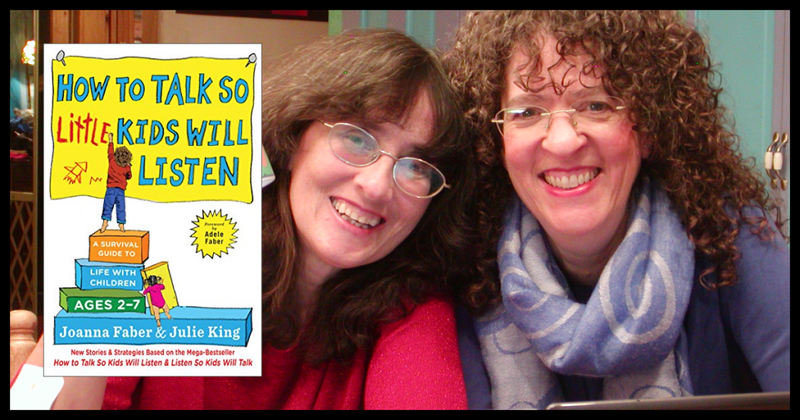 I’d like to welcome my guest today, Julie King, who is one half of the writing duo behind the new book, How to Talk so Little Kids Will Listen, and if that title sounds familiar, it’s because it’s part of what seems to have become a family of books around the classic How to Talk so Kids Will Listen and Listen so Kids will Talk by Adele Faber and Elaine Mazlish. Julie has been educating and supporting parents and professionals since 1995 and in addition to her work with individual parents and couples, she also leads How to Talk workshops and gives parent education presentations to schools, nonprofits, and parent groups. Julie received her AB from Princeton University and a JD from Yale Law School. She lives in the San Francisco Bay area and is the mother of three. Welcome Julie. Jen: 01:14 It actually does feel a little odd to welcome you when we’re in your own home. Julie was kind enough to invite me to her home today to have this conversation. So thanks so much for taking the time. Julie: 01:23 Oh my pleasure. Jen: 01:24 So I wonder if you can tell me a little bit about the genesis of this book because it kind of runs in the family a bit, right? Julie: 01:30 Okay. So to tell you the whole story, I have to go back in time to when I was six months old. Jen: 01:37 This is going to be a long story! Julie: 01:38 I’m not going to go through all the details, I promise, but when my parents moved into the house that they still live in when I was born, right before I was born and my mother didn’t know very many people in the neighborhood. I was six months old. She was looking out the kitchen window and she saw another mom with two little kids the same age as me and my brother and she invited that woman in. That was Adele favor and the two of them became very good friends. Joanna. Joanna was the baby and her brother Carl was the older boy and she and I went to nursery school together. Adele took these, what they call Child Guidance Workshops with Haim Ginott and used to call my mother daily and discuss what she was learning and they would talk about what they were going to try on Joanna and her older brother and her younger brother and me and my older brother and younger sister. Jen: 02:27 So you were a Guinea pig for the original book? Julie: 02:30 That’s right. I was a Guinea pig. Um, so she and I became very good friends. We went to school from nursery school all the way through high school together. And um, I was aware that her mother was writing these books as a teenager. I remember going to her house and seeing her mother and Elaime Mazlish writing on yellow legal pads on the kitchen table by hand, and in the eighties when the one of the books came out or was coming out. I got to copy edit the book and I think I found a coma out of place and I felt very proud of my contribution, but I never actually expected to be doing anything with the work until I had my own child and he was in preschool at the San Francisco JCC and they were looking for a more than one time event for parents. They used to bring people in to speak, but they wanted to do something that would be ongoing and I at the time was studying group facilitation and group development and of course I knew this material very well, having grown up with it. So I volunteered to lead a group which was originally scheduled as an eight week group and halfway through everybody said, well, we need another eight weeks to really learn this. At which point I panicked because I wasn’t quite sure what I would do. Well we turned it into an ongoing support group and that first group met for four and a half years. The other people heard about it and asked me to bring the workshop to private groups into nonprofits and that’s how I got into leading the groups originally and my friend Joanna, who is still a good friend of mine who still lives in New York, and I moved out to California…This will happen in New York originally. She started leading workshops in New York, so we would talk to each other about what we were doing and what we were discovering and quite a few years ago when I was still mostly working with parents of preschool-aged kids. People said to me, we love this book, but we need more examples, and so I said, I know what to do. I called Adele and I said, I have your next book for you. She’s written one for teens and she’s written ones for kids at school. I said, now you have to write one for little kids, and she said, more or less. I quote, Julie, I’m too tired. You have to write it. So I called Joanna and I said, Joanna, we have to write this book. So we’ve been collecting material for many years and working very hard for the past two years to really polish it up and create this book. Jen: 04:49 Yeah. Awesome. I did a little comparison between the new book, which as we’re recording has not been released yet, but once, once you hear this interview, you will be able to get the book on Amazon and other bookstores. So I have an advanced copy and I did a little comparison between that and the classic How to Talk so Kids Will Listen and it seemed to me as though the overall concepts are quite similar. The certainly a big focus on handling emotions and engaging cooperation and praise. There’s a little less than the new book on encouraging autonomy, which surprised me a little bit, and you have a spanking new chapter on working with differently wired kids, which we’re going to talk more about in a little bit. I’m guessing that a fair number of my listeners have already read or maybe even own the original book. And maybe that was, you know, they bought it for their first child and maybe they have a toddler in tow now. And I’m wondering if you can help us understand what they would get out of this book that they wouldn’t necessarily get if they have already bought or read the original. Jen: 06:48 Or another book! Julie: 06:49 Another book, right – no, not another chapter for this book; this book is done. So that’s the answer to the autonomy question. And your other question was, what’s different about this book? Julie: 07:01 There are a number of differences. I think the biggest reason for people to get this book is because every example is about little kids. If you get the original book, there are little kid examples are 10 examples. We, we just are offering you lots and lots of ways to use these tools from stories that were given to us by actual real life people, parents and teachers. And in my experience, the tools make sense to people. But when you’re in the heat of the moment, it’s hard to think of what to do. Yeah. And if you have somebody else’s example and when you have, when you can picture it in your mind, when you can sort of rehearse it a little bit ahead of time, that’s when you can pull up the tool more easily and use it in the moment. So I think that’s the biggest advantage of, of. I mean, I, I love the original book, obviously… People should read both probably, but if you have little kids that make sense to read a book, just about little kids. Jen: 07:56 Yeah, that makes sense to me. I often find when I read books that the principles are aligned with what I’m thinking, but you know, the, the examples and the language they talk through, I’m thinking what would really happen if I said that to my two and a half year old when she really get that? Would you understand it? And so what you’re saying is that because the examples in your book are geared towards younger children, they’re more easy for parents to apply, is that right? Julie: 08:22 And then there’s are several other differences. One of the, the differences that I think will be very helpful to parents is around the idea of taking action. So in the original book there’s a, there’s a skill called take action without insult and doing the workshops. What I found is a lot of parents get confused. Well, what actions should I take? How do I know what to do? I mean, I’ve tried acknowledging his feelings. You know, you’re in the mood to draw. I’ve given them information. Walls aren’t for drawing on; I’ve given him choices. You can, you can draw on this box, you can draw on this paper. But he still took the, took the Sharpies. One of my parents groups, you know, I don’t know why…and started drawing on the walls so, you know, so I felt like I had to say, no, I’ve told you, I’ve told you you can’t do that, you bad boy. I’m taking this away from you. You may not. Now you’re not going to get a chance to see. I’ve already told you that sort of language. And they’re like, well that’s taking action. Isn’t it? Well, the, and you’re nodding your head. Yes it is, and it’s, it’s also we want to offer an alternative, um, in which we protect ourselves or we protect property without attacking the child. So the action is going to look the same. I’m still going to take those Sharpies away, but, but what I’m going to say is I don’t like my walls drawn on. For now, the sharpies are going away and the child knows that I was drawing on the wall. Now I can’t, but you’re not doing it to me, the child. You’re not doing this to make me suffer. You’re doing to protect yourself and protect the walls. Right. So I think that’s, that’s. I think we explain that in the book in a way that’s a little easier for parents to figure out, okay, what do I do in this next situation? Jen: 10:04 Yeah. That makes a lot of sense. I’m wondering if I can selfishly talk a little bit about situation that I’m having around acknowledging feelings. Yes, because I think that that’s, it’s a really central theme in the book and Joanna actually wrote that chapter and she described a scenario where she videotaped to show for a five year old and a three year old wants to know why she didn’t a tape a show for him when he had asked her to tape it and she says to her, a missed TV show doesn’t really seem as though it’s qualifies as being worthy of a meltdown. But to her son it really was because it was important to him, or, it had become important to you and so it seems as though the best way to help him get over it was to help him get through it is the advice that’s given in the book. Julie: 10:47 And so, you know, when my daughter’s having that kind of meltdown, let’s just clarify, to get, to help him means to say, Oh, you LOVE that show! You would have liked me to tape that one for you too. Jen: 10:58 Or a different show that wasn’t taped. Jen: 11:01 Um, and so, you know, if, if my daughter is asking for ice cream at bedtime and I say you really, really want ice cream, she seems as though she gets kind of hopeful and it feels to me as though I’m sort of getting your hopes up and then, you know, sorry, you still can’t have ice cream and I’m, I doing something wrong when I’m doing that or…? Jen: 11:18 Or partly no. Julie: 11:24 I think the point is what you do after that? So when you, when you acknowledge the feelings that that child has for something that you can’t grant, like I can’t make that TV show rebroadcast. Right? So that’s in a way easier. Jen: 11:38 Yeah, it is. I wish I could have, I wish I had known I would have done it. You really wanted me to record it? Oh that’s so disappointing. Yeah, it’s a natural limit. It’s not one that I have set. Julie: 11:51 But she knows that there’s ice cream in the and you could get it if you wanted to. So that’s a different situation. And so we can’t just stop at, Oh, you really want to ice cream because I think, yes, I do. So could I have it? So that’s one. So that’s when you have to follow up with some of these other tools that we have in the book to have ice cream before bedtime. It’s not good for your body. It’s my job to help keep your body healthy. What’s, let’s make a, let’s make a plan for when you can have ice cream. How about tomorrow afternoon and when you get home from daycare or you know as a snack or whatever it is that would be acceptable to you so that she knows that you get it, that there’s, that she’s, she’s going to get it at some point, maybe you write it down on a piece of paper so she knows that there’s a plan and a commitment to her. And it’s not that any of these upper, you know, if you use any of these tools, she’ll say, oh thanks mom. It’s okay. She might, she may or may not still cry about it. It’s important that she knows that when you feel strongly about something you don’t cave just because she is distressed about it. Yeah. I think sometimes we get upset with our kids when they get upset with a limit and that’s just natural. I’m not getting what I want. I feel frustrated and we can empathize with that, with the frustration, without caving to what they did is they want. So in the ice cream case, you know, someday she will get ice cream and maybe it would help to know when that’s going to be. It is a lot easier to acknowledge feelings when you don’t have to also say sorry. Jen: 13:19 Yeah, this is my limit that I’m putting on you. Yeah. So the second chapter of the book is on tools for engaging corporation, which seems to me to sort of be another way of saying how do we get our children to do what we want them to do. Um, and so this conversation I’m having with you follows hot on the heels of an episode that I recently recorded that was named exactly that, that was based on Alfie Kohn’s work, and the premise that the relationship with our children is really core to engaging cooperation and so I’m on board with that and with setting up the conditions that make my daughter want to cooperate with me. And after reading the book I use some of the tools that you described to get my daughter to stop playing and brush her teeth, you know, and she said she didn’t want to do it, she wanted to keep playing. And I said, well, do you want to walk or hop to the bathroom? And she said, I want to hop to the bathroom. I said, great, let’s go. But it just, it strains my brain every time she says no to something to have to think, oh, is it walk or hop now or is it, you know, what other creative thing can I come up with to make her want to do this thing with me that I want her to do? Because brushing your teeth is important, you know, it’s not something that I’m arbitrarily saying we must do this now. Right? Um, so does it get any easier that having done this for a year or two now, does it get easier? Julie: 14:32 So the, the short answer is yes, absolutely. You know, and the more that you engage her in play, which is how I hear, you know, she, she, she didn’t want to stop what she’s doing, do some chore. She wanted to have fun. And so you said, well, let’s have fun doing this. Let’s hop. As she gets older, she’ll understand better why she needs to brush her teeth. She’s just too young to really understand about cavities and teeth. Jen: 14:56 She’s two and a half years old now, so yeah. Julie: 14:59 But for now, instead of getting into a battle about it, you’re connecting with her that you’re, your strengthen your relationship with her and she’s, she’s learning that. It’s fun. It’s nice to make things fun. You know, if you have to, when when I have to clean up or I have to fold laundry, sometimes I’ll put on a podcast. Maybe yours now… Because you know, otherwise sometimes that yours not that exciting. So parents do often ask me this question like how long does this go on? Julie: 15:30 And my answer is usually, well it’s usually goes on a little bit longer than you really feel like you can stand it. At least speaking for myself. Jen: 15:37 Hm…seems transferable to a lot of situations in parenting. Julie: 15:54 But then he was like, you know, I’ve done that a few times. Boring I don’t want to do that anymore. And he said no as two year olds are want to do. Yeah. And I have to admit, I think at first I did something like, well you can’t have dinner unless you wash your hands. And of course this was late in the day and he was tired and he was hungry and just didn’t really work very well because then he just dug his heels in deeper and we got into this little conflict. Julie: 16:18 So I switched gears and I sort of in desperation, this is how I always come up with these things. I said, Oh, you know what? I just heard an and for the story you have to know that Asher was really into Sesame Street. I just heard that big bird is missing and they think he’s hiding in children’s bathrooms. Should we go take a look? Hey looked at me like, yeah. So we run off to the bathroom and I can look around. You see him? He’s like, no. Well let’s put the water on and see if he comes out. Put your hand under… Did you catch them now? Of course. Now by this point he’s figured out it’s a game, right? Let’s try this soap. Is he in the south? No. Look at your hands above your head. No, he’s not there. Well, I don’t know. Julie: 17:00 Try the water again. Should we look at… We looked in the towel. Got His hands washed, was so much fun. The next day. Dinner Time. That was going to be my question. We look for big bird again several days in a row. We looked for big birth, then we branched out, Cookie Monster, Bert, Ernie. We ended up at some point I remember thinking, what am I going to do? Yeah, there are a limit to the number of sesame street where we branched out to other books. He was reading Winnie the Pooh. Then we started pretending like, I think you do you want to wash your hand in Spaghetti water. We’re having spaghetti for dinner, so I would just pretend that it was spaghetti water and this went on for not just days, not just weeks, definitely months. I mean, I can’t actually remember how long it went on. I just remember once coming home and thinking, oh, I forgot to think of how I’m going to get his hands washed, and he was with the babysitter. I’m like, can you think of something that we haven’t done it, but if we did it, if we played, he was totally on board and it was. It turned out to be sort of a fun thing as long as we could get ourselves into it, right. So, well, by the time I told this story too, I remember some, some group of parents, he was in middle school. I’m like, well, at least now he’s, he does wash his hands before dinner and we don’t have to play a game, you know, it didn’t go on forever, but it does feel…at the time. You think, are they ever going to just do this? And the answer is yes. Julie: 19:05 Well the toothbrushing thing. Okay. I had to do the same thing. Yeah. And I have three kids so I had to come up with a lot of ideas. One of the things I like about leading the workshops is that parents get together and they share their ideas. Yeah. And I encourage people to steal each other’s ideas. I mean, it’s just exhausting to come up with these things. Right? So one of the things that worked for me for awhile, it was an also, I came up with this one out of desperation and it’s going to sound really bizarre, but it worked well with my kids. I said, do you know that I heard all the zoo animals have escaped and they’re hiding in kid’s should be looking at your mouth. And suddenly the kid who wouldn’t open his mouth is like, ahhhh. Jen: 19:47 I’m doing that tonight. Julie: 20:04 I had another, another um, parent who they would pretend that they were going to the dentist office and they would, they would make a big deal. Like, would you like to sit in my dentist’s chair, my lady. And you know, there’s all kinds of games you can play and you’re right, you run out of ideas like, well, okay, so tell me, tell me, you’re making me feel bad because we, we had to cut seven chapters out of this book. Jen: 20:34 Parents are going to be so disappointed. Jen: 20:43 I guess the lesson that is to try and apply from, from what is in the book, because that was one I got out of the book was, you know, there’s a big new section on seeing the tools in action. And so there’s this toothbrushing must’ve been part of that when I read it, I felt like I was sitting in a parenting class with you and then there were five other people in the room and they were all talking about what worked and what didn’t work is not everything works for everyone. And so I was wondering was that, was that the intent? Julie: 21:07 Yes. In the workshops, people get a lot out of hearing from each other. Like I say, I had a mom in my very first group who got a lot of traction by using a Donald Duck voice. I can’t imitate it so I’m sorry I can’t do it for you, but she could do it. You know what? Jen: 21:24 We’ll imagine it. Julie: 21:25 In the back of your throat. I can’t do it. Anyway, she, she said if I said it’s time to go get your backpack. They didn’t do it, but if Donald Duck told them they would do it. So I took that idea and I’m like, well I can’t do Donald Duck, but I can pretend. And I again, I was so nervous about doing this in public. I pretended to have a British accent, which I can’t really do. Julie: 22:41 So they don’t care. I used to. I also used this saying to them, okay, I’m telling you what my most embarrassing stories. I used to pretend I was an opera singer and then they would do things that if I just asked them to do in regular, they wouldn’t… [Sings] “It’s time for bath.” I would just shock them so much. So I tell people in my groups, you don’t have to be an opera singer; you don’t have to be good at English accents, you don’t have to be able to do Donald Duck, which I can’t do, but if you can attempt any of these, it changes the mood, the mood, and it makes it more fun and as long as you have to do these things anyway, you might as make it. Might as well make it fun. Julie: 23:23 Oh, but then it wouldn’t have that R problem. Jen: 23:26 Yes. So I know you have three children. I only have one and frankly that’s the way I’m planning on having it stay. But I know that a lot of parents who are listening to the show have more than one child and maybe most interested in the chapter that you have on resolving conflict. And so if, uh, if there was one nugget of wisdom that you could distill out of that chapter for the parents who have more than one child, but would that be? Julie: 23:53 Well, that chapter is not about more than one child. I’m going to answer your question about more than one, which is don’t take sides. It’s really tempting to say, come on, just give it to the baby. She’s just, she’s too little. She doesn’t understand. But that kind of response can really build up resentment between siblings. So, um, some people call it the sportscasting sometimes it could just be helpful to say, Oh, you’re not ready to share that. You’re not finished with it. Oh, the baby saying I want it, I want it. What do we do in a situation like this? So I’m not just saying, okay, kids, good luck. You figure it out. I’m leaving, I’m out of this. But I’m also not going in and saying, no, you’ve had it for 10 minutes now. Julie: 24:35 Give it to the baby or give it to the other one, whichever one. I do a lot of acknowledging feelings. So that’s the theme of the book as you noticed. And I’m going to do that even when there’s two kids who are fighting and sometimes there’s an act of conflict and sometimes I’m just, I’m just thinking about a conflict that my kids had. They were, they were a range of age, like six years between the oldest and the youngest. The youngest was definitely in the two to seven range and I think the middle was in the two to seven range. My oldest was a little bit older when they, we used to have a, used it, we have a hook in the ceiling and we used to have a T bar that they could hang from and when we would get home they would fight over who got to use it. Julie: 25:14 And I remember once saying to them before we got in the door, okay, what should we do? Everybody wants to use the T bar first and there’s only one T bar, what should we do? And they negotiated and talked about it and came up with a system that I thought was pretty clever. The oldest one was probably the instigator because he realized that the youngest didn’t want to wait, so she got to go first for two minutes. And then the middle one who could wait a little longer, you get to do four minutes. And then the, the oldest who would be willing to wait longer, he would get six minutes on it and they all signed onto it. Jen: 25:49 I would never have come up with that. Julie: 25:53 When we help them problem solve a situation like that, they often will come up with solutions that we wouldn’t have even thought of. Jen: 26:01 Yeah. At what age do they start? Do they start being ready to do that, do you think? Julie: 26:04 Not at two. Jen: 26:05 Yeah, because, you know, I my daughter’s two and a half and when I asked her a question, she doesn’t seem to understand. She just says, hmm, that’s, you know, if I try something like that, she’ll just kind of say, hmm. So at what point can you sort of start expecting a response to come back? And you know, the tennis ball to get hit back to you? Julie: 26:22 Well, I, I remember when Asher was three and Rashi was just a baby, so up until about problem solving, which you can do with a single child. The reason I remember this story is because some reporter called up Adele and said, can you use problem solving with really little kids? And she said, I don’t know; call Julie. Julie: 26:46 I think he couldn’t get Joanne on the phone. He called me because I was in California. And I thought, do I use problem solving? I’ll have to think about it. I’m like, well, I guess this morning I did because Rashi was, he was just a month or two old. And um, I really wanted to take a shower, which was challenging, right? And so Rashi had fallen asleep. And I thought this is my chance if I can get Asher on board. So I went to tell Asher, let’s go in the bathroom. And he’s like, no, let’s play with the magic mitts. And I remember thinking if I just try to strong arm him, he will scream. The baby seemed kind of fussy so I wasn’t sure he was gonna stay asleep. And I wasn’t gonna get my shower, so I did a very simplified version. I said, Oh Asher, you want to play with the magic mitts? I want to take a shower. What should we do? And he thought about it and he said, hm, maybe I’ll take my sesame street’s tapes in the bathroom, which we had done in in times past and I, I said, that’s a great idea, let’s do it. Julie: 27:48 And I got my shower. So it was not a high conflict situation. But I try to look for opportunities to use that language with him. Like, we have a problem, you want this, I want that. What should we do? And I would encourage you to use that kind of language with your kids. Even at age two, you can, she can, she can understand, oh, you want that? And I want that one. Jen: 28:08 And so do I start now. You know, when I’m starting to do that now, do I start by proposing a couple of solutions and then picking the one that I think is fairest, like verbally going through that process or how do you build to the point where the child can come up with her own solutions? Julie: 28:22 Well, you’re going to be working with simple problems. It’s like, no, you want the blue cup and I was going to drink from it. What should we do? Right. And she’ll probably say I drink from it and you might say, okay, how about you drink from it and I drink from it next. And if and if she says, okay, you can say, oh well we figured out a solution. So she just gets the idea that this is what we do when we’re in conflict and that’s what chapter three is all about. When you’re in conflict, not necessarily between two kids. It could be parent and child. What do we do? And that’s, that’s one way to teach her about problem solving, which is when one of the ways we can resolve conflicts. Julie: 29:00 Yeah. And so that’s, that’s a tool that I can use as a parent of one child and also the parents of multiple children can use with their children and also the children, we assume we’ll learn to negotiate among themselves when the parent is not around, ideally, I’m remembering another, another time when I used it, Asher was four, he had a friend named Matthew and matthew came over to play after school and then I was driving them to music class and we’re going to meet his mom. His mom was gonna pick him up a music class. And this is in the days when we didn’t know about airbags in the front seat. So kids were allowed to sit there. Julie: 29:35 Oh, the things we used to do! Julie: 29:37 Yes, right? The wild and crazy times. So we were going down to the car and Asher and Matthew started arguing about who would get to sit in the front seat. And fortunately the doors were locked so we got to the car and they hadn’t resolved it. And I, I remember being tempted to say, well Asher, he’s the guest. You should really let him sit in front. Um, but I, but I just want to do that really. So I said, oh, this is a problem. You both want to sit in the front seat, but there’s only one front seat. What should we do? I think Asher for said, well, I should be able to sit in the front seat because it’s my car. And Matthew said, well, I should be able to sit in the front seat because I’m the guest. And I said, well, it sounds like there’s something about sitting in the front seat that you both really like. And Matthew said, I like to be able to see out the window. You can see better in the front seat. And Asher said, well, I like to be able to choose the music. You can reach the cassette tape, aging myself, a player in the front seat. And there was a pause and Matthew said, I can sit in the front seat and I’ll put on your music. And Asher said, oh, okay. And you know, it was the perfect solution that I never would have been able to figure out it had I not reflected back to them. Oh, so you want the front seat because you want to see and you went the front seat because you would have decide what music we listened to. Jen: 31:02 It’s not that they both want the front seat is that they want different things about being in the front seat and both of those needs can be satisfied. Julie: 31:08 So I was lucky. I mean in the sense that. And I didn’t know where it was going to go when I said, well two people, one front seat, what do we do? I honestly didn’t know how it was going to be resolved, but I think that by doing it that way, first of all, we, we preserve their relationship. Had they gotten into a big fight about it, when you can just imagine that next, the next day they’re not playing with each other. Who knows what. Right. Julie: 31:34 They would have been mad at me and they would have felt it was unfair and Matthew wouldn’t have wanted to come over again. Like, who knows. Right. So I think that’s one of the benefits of involving them in the problem solving. Jen: 31:47 Yeah. Okay. So the chapter on children who are differently wired is written in your voice. I’m wondering if you can tell us a bit about your experience because I think a lot of times when I read parenting books kind of geared at mainstream parents, there really seems as though that the parent has to do the work themselves of figuring out how to make it applicable to their differently wired child. Can you tell us a bit about your experience in how the techniques described in the book can be applied to children who process information differently? Julie: 32:16 I think one of the messages we want parents to get from this book is that all of these tools can be used with all children. Because underlying all these tools is the idea that all kids want to be understood, all kids want to be respected, all kids have a drive to do things for themselves. And what makes it tricky for kids who are differently wired is understanding as a parent, how they’re experiencing what their feelings are, how, what their experience is and how to acknowledge that. Because it’s because it’s often so different from our own experiences as people. So I’ll give you an example. In one of my early groups, I had a dad who had a little boy who used to put up a big fight if he didn’t get to be used one of his three favorite pairs of socks. Julie: 33:15 And in the morning, they would use those three pairs of socks early in the week and they would run out and she’d have his other socks. And the dad tried all the usual look, they’re the same. It’s, you know, this one’s red. That’s when it’s red. Like, what’s the difference? We have to go get your socks on. We don’t have time for this nonsense. All that kind of thing. Came to the group and I told them about my oldest, who, when he was very little with what they say, hypersensitive in his lower extremities, which is to say he couldn’t stand to be touched on his feet and his legs were very, very sensitive. So, and if you can’t touch your feet to the floor, you can’t learn to walk. So we needed to desensitize them, but he really felt a lot of things that most of us, if we feel them, they, they’re not noxious. New Speaker: 34:57 Because the behavior is the problem, right? Julie: 34:58 Because the behavior’s the problem. Exactly. And you know, one of the big messages of our book is that there’s a connection between how kids feel and how they behave and if we want them to behave well, it benefits us to pay attention to how they feel and how we talk to them influences how they feel. So the, some of the tools in that chapter on kids who are definitely wired, are a way for parents to tune into how their kids are, are different in terms of their experience of sensory issues, social issues, all the ways in which kids are different. So it’s not a book about how to do therapy for kids who are definitely wired, it’s really to how to use the same communication tools for those kids. Yeah. So, so I hope that all parents read that chapter and not just kids who have been identified as being differently wired. Julie: 35:50 The first tool that we introduced in that in that chapter is the idea of joining the child in their world. And I think that’s something that can be really challenging, especially for kids who are on the autism spectrum who don’t appear to want to interact with us as much as our other kids and it can feel like rejection and can feel like there’s no way to connect with that kid and the kid doesn’t want to connect. So in my workshops, I encourage people to figure out what is comfortable and interesting to that child and connect that way, before you try to engage their cooperation and solve problems. And one of the most touching stories I heard, which we include in the book, was from a mom who son spent a lot of time alone in a tiny little tent playing on his iPad, not talking to anybody, not interacting. Julie: 36:41 And when we suggested this idea of joining him in this world, she said, I didn’t really know how this was going to go or whether it was at all possible, but she went home and she tried to do her homework there. He was in his little tent and she said she went up and she knocked on the tent, which was fabric. So it was very, very quiet. And she realized that he was very sensitive to sound. So she very quietly said, can I watch you while you play? And he nodded his head and so she just, she said it was a small tents and she couldn’t go in it, but she just watched. And then she asked him what he was playing and he answered her and he’s playing the bubble game, which she said was surprising because he usually wouldn’t have even answered her. And so she watched him play this little bubble game and then she asked me if she could play and they ended up passing the iPad back and forth, and he showed her how to play. He had never done this before with him. It gives me goosebumps just to think about it, you know. Jen: 37:36 And we assume previously that she had been focused on getting him out of the tent. Julie: 37:39 Exactly: come on, let’s do this. We have a puzzle. I’ve got blocks come, come, come. Yeah. So, not that we don’t have things that we want all our kids to do that we have to do every day, but if we don’t find that time to connect with them, if we don’t have that, those moments where it’s just about being together and enjoying each other and then we’re going to have a lot harder time getting them to do all those others things that we need to do. It reminds me of a phrase that’s coming and respectful parenting circles: your child isn’t giving you a hard time. She’s having a hard time. They don’t do these things just to annoy us. Feel as though they are, that there are real reasons for them doing these things and if we can better understand what those reasons are, then we can be in a better position to make a connection that moves the relationship forward. Julie: 38:32 Yeah. Yeah. So when people come to me and they say, how do I my kid to [fill in the blank]. Julie: 38:39 Yeah. I will often…so tell me like, how is the child’s feeling about it? Because if I, if I don’t know that I don’t, I, I don’t know where to go yet. I love what you’re doing. Taking the research and bringing it to parents of young kids and I also want to remind people that you can read that it’s important to acknowledge feelings, to give kids choices, to invite them to problem solve with you and you can know all these things intellectually, but when you’re in the heat of the moment, when you’ve got to get out the door because you have a job to get you and you have to drop them off at school or daycare and they’re crying because they don’t want to put their shoes on and the baby’s crying and, and you’re running late. It’s very hard to figure out what do you do in that moment? What feelings do I acknowledge? Sometimes you feel like I don’t even want to acknowledge feelings. I just need to get out the door. So what we’re trying to do is to give parents lots of examples so that when they’re in the heat of the moment, they can think, oh, you’re not in the mood to go to school. You wanted to play with that. Let’s put that somewhere special so we can find it when we get home and we’re relying less on, I don’t care. We’re going, I’m grabbing you. Jen: 39:58 Which may, as long as the child is small enough to get the job done, but it doesn’t really help to build a relationship or, or engender cooperation for the longer term. Julie: 40:07 And it leaves everybody frazzled in the morning. Right? Jen: 40:09 Yeah, yeah, yeah. We are definitely seeing that as well. Now we’re in a daycare environment. Getting out the door in the morning is a key. Julie: 40:17 It’s a huge stress on parents getting out the door. Yeah. Well, thank you so much for taking the time to talk with us today. I really appreciate it. You’re welcome.